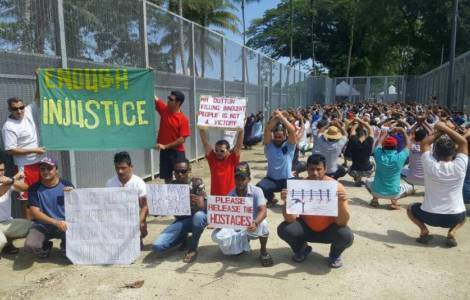 OCEANIA/AUSTRALIA - Bishops' appeal for Christmas: "Let's find refugees a home"
Port Moresby (Agenzia Fides) - "Enough is enough. It is time to find these people a home and to definitively end the intolerable situation": says the Archbishop of Brisbane, Mark Coleridge, President of the Australian Bishops' Conference, expressing, in the name of the Episcopate of the new continent, the 'hope that politics will deal with the difficult situation for refugees and asylum seekers on Nauru and Manus Island. This Christmas, the Bishops ask politicians "to consider a fresh return to Canberra in the new year. We cannot afford to have the plight of these people made even worse by making their futures the subject of bitter electoral disputation in the year ahead. Let’s find them a home", reads the text sent to Fides. "Our elected representatives have returned home for Christmas without resolving the offshore detention crisis that confronts our country", the text continues, hoping that "Parliament will favour laws and policies that will bring to an end the saga of refugees and asylum-seekers who have had to put their lives on hold on Nauru and Manus Island". "Australia is a rich country - note the Bishops - with a robust rule of law and multicultural tolerance, an attractive place to live and to find peace and security. It is no surprise that courageous and resourceful people fleeing persecution anywhere in the world would be happy to make a home here, just as they did after the wars in Europe and in southeast Asia. Our politicians are rightly committed to maintaining secure borders and an orderly migration program. We always need to be asking if we Australians could be more generous in the number of people in humanitarian need we receive each year as part of our orderly migration program".